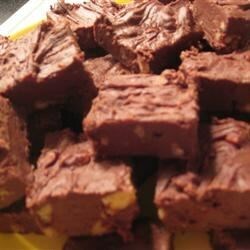 "This rich chocolate fudge recipe is as easy to make as it is fattening!" Couldn't find "sweet german choco" so I just used all semi-sweet chips. Turned out GREAT. Very creamy and a huge hit. I split the recipe while pouring and made 1/2 w/o nuts.